As I sit here planning periodised training for events 25-50weeks away, it brings to mind what’s really required to reach a goal, in sport and life in general. It’s pretty simple, but actually carrying through with it is the hard part. Committing to a plan and sticking to it consistently over time, with consistency being the key word. ‘Achievement is largely the product of steadily raising ones level of aspiration and expectation’ ITU athlete - Sam Warriner. This quote was shown at the start of the now famous Bevan Docherty / Kris Gemmell video showing an amazing sprint finish in New Plymouth. And it’s so true. Recently I had the pleasure of coaching Kristy Hallett, an athlete of mine for Ironman Melbourne. She did a great PB taking 35mins off her best time, finishing in 9:42hrs. Funny thing was that I contribute a lot of her success in that race to not her Melbourne preparation, but the one she did for Hawaii 2011, which started some 12months earlier. 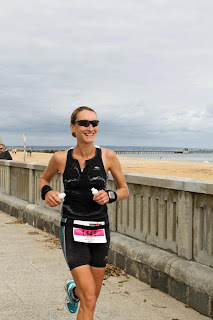 Kristy has steadily improved from the complete novice triathlete I met back in 2007 to now being 1st Female age grouper and 11th Overall at Ironman Melbourne in the best female field outside of the Hawaii ironman. Kristy like many who are successful over time, consistently adheres to a training plan, one that matches her ability and aspirations at the time. Kristy has steadily gained endurance, strength and skill, never getting ahead of herself. She continually achieved and then reset her expectations as she developed, and the result of that is what you see today. The longer the period of time you allow yourself to reach a goal, say 30-50weeks prior to your ‘A’ Race, the more gradual the increase in effort can be and the more effective the end result. Often I come across clients at the start that are super enthusiastic to the point of extreme. More often than not these athletes are the most likely to fizzle out the quickest. The slow burner who is prepared to be consistent and do what required in moderation in the end burns brightest every time. So I am sitting here developing plans for athletes of all levels for goals in late 2012 and 2013, like the NZ Worlds, Ironman Melbourne or a Gatorade Sprint race. The earlier these guys set themselves on a considered path to achieving their main goal, the more gradually and safely they can build their level of aspiration and expectation to that goal. With excitement, I can say that Kristy is now turning pro in Long Course racing in 2012/13. Once again we will look at her periodised training plan, but now with new goals and expectations to get her to the next level of aspiration and expectation. This applies to every athlete of every level thinking about their own way to achieve their goal.